Fulani herdsmen under the aegis of Miyetti Allah Cattle Breeders Association of Nigeria (MACBAN), has urged the government to urgently begin a probe into the activities of the Senate President, Bukola Saraki, to ascertain if he was among those sponsoring Nnamdi Kanu, the leader of Indigenous People of Biafra (IPOB). In an interview with journalists in Makurdi, the National Coordinator of MACBAN, Garus Gololo noted that the activities of IPOB in recent times demonstrated that it was more of a danger to the unity of Nigeria than the clashes between Fulani herdsmen and farmers. He argued that the statement made by Saraki, faulting the proscription of the group by the Federal Government, was inciting and a clear signal that the Senate President might be supporting the agitation by IPOB to divide Nigeria. He said for such a statement to have come from Saraki, it showed that he was no longer fit to lead the Senate. Gololo said he believed that the former Kwara State governor’s presence in the National Assembly was a threat to the unity and oneness of Nigeria. “I think it is a high-time the Federal Government commenced full scale investigation into Senator Bukola Saraki’s activities in the Senate. I doubt if that man has the interest of this country, Nigeria, at heart. “For the number three citizen to be saying different things from the government, which he is fully part and parcel of, shows that Saraki hates Nigeria, Buhari and Fulani herdsmen and as such, his leadership is in doubt and he should step aside. “We can’t continue to have someone in power that would declare support for a group agitating to break up Nigeria. We are for one Nigeria and in unity we stand. MACBAN National Leader also commended the Federal Government’s decision to proscribe IPOB as a terrorist group. He described the proscription as a ‘’right step in a right direction’’ that would permanently cripple the plans of the pro-Biafran group to break up Nigeria. 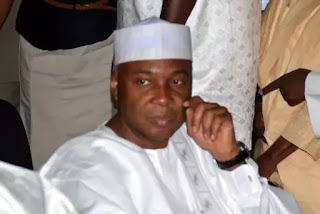 Saraki had last Monday condemned the ban on the activities of IPOB by the South-East Governors Forum and its classification as a terrorist group by the Nigerian Army.